I am wearing this costume. 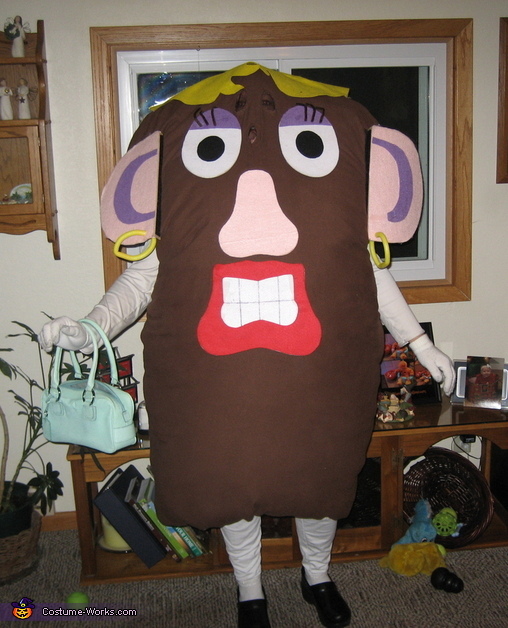 Mrs Potato Head is a homemade costume I made without a pattern. It was just an idea that came to mind. The body is made of light weight flannel, lined with a sheet & filled with polyfill. The eye & mouth area (for my real eyes & mouth) is covered with organza so I could see through it but it wouldn’t be obvious. The parts were all drawn by hand, cut out of thin cardboard & covered with felt. All parts are attached with velcro and are able to be changed, just like the toy! The back pocket carries the additional nose, mouth, set of eyes & ears. Instructions & Tips: Sew body and liner together, except at the bottom edge. Cut arm holes, eye & mouth hole. Sew organza to cover eye & mouth hole. Make parts that you want to interchange and glue velcro to the back of each part. My parts were all drawn on an 8.5 x 11” piece of light weight cardboard so they were proportionate. Measure the velcro the same length for attaching the each part and sew it onto the body, don’t sew it to lining. Cut material for the back pocket and sew to only the body, not lining. Fill front & back of body with polyfill stuffing and sew up the bottom of the body. When you are cutting arm, eye & mouth holes remember to cut them a bit lower and attached the velcro to the body a bit lower because once you put stuffing in the body it will “shrink” up. I actually stuffed mine, got an idea of where to put everything and then unstuffed it. I used almost 100 oz of polyfill in the body. The first time you wear it, it may be a bit uncomfortable or odd because of all the polyfill and having that weight on you. Have fun and let people change & rearrange you parts!